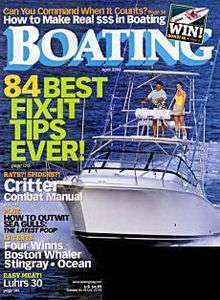 Boating is an American enthusiast magazine published by the Bonnier Corporation. 1988 – 2009 Hachette Filipacchi Media U.S.
↑ "Alliance for Audited Media Snapshot Report - 6/30/2013". Alliance for Audited Media. June 30, 2013. Retrieved February 2, 2014. ↑ "Our Magazines". Bonnier Corporation. Retrieved 1 August 2015.